Weird things you can grow: OCA! I was at Apache Seeds last weekend — which, by the way, is amazing: I picked up some alfalfa which I want to use as a cover crop, which is a post for another day; their seed selection is probably the best of any place I’ve been; and they had a small but very healthy and enticing-looking collection of nursery plants. Among those enticing-looking plants, I saw an oca plant (variety ‘Sunset’) and couldn’t resist. Oca (oxalis tuberosa – you can tell it’s from the oxalis family, as its leaves have the same characteristic shape as ornamental oxalis plants) is a starchy edible tuber that comes from South America. It’s also known as New Zealand Yam, apparently. That makes sense, since in botany*, all plants from South America have New Zealand in the name. 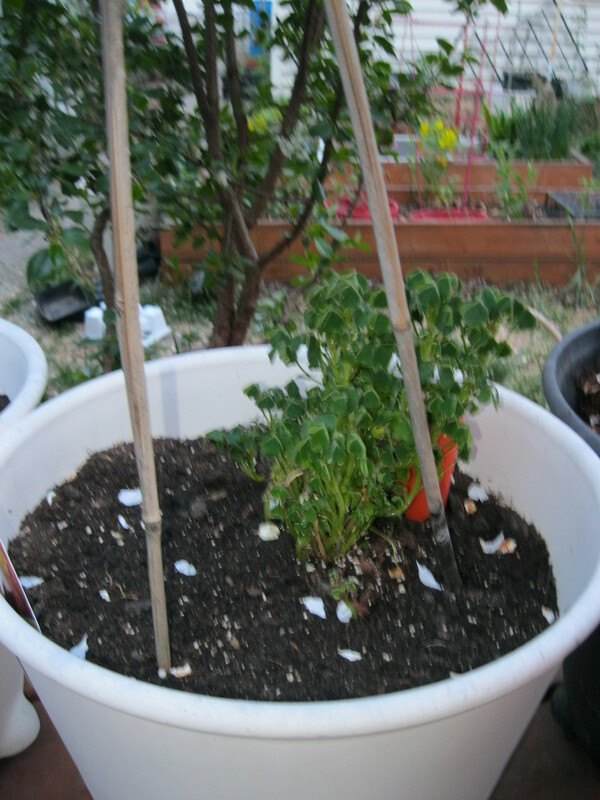 Since I’ve run out of sunny garden spots, I planted it in one of my remaining pots. I have no idea how it will do in there. It may suffer from the lack of space, but that’s ok, because I’ve learned that it’s probably doomed to failure anyway. Upon doing further research, it seems like this plant is not suited to the Edmonton climate at all. It doesn’t start to develop the tubers until the fall, when the days get shorter — less than 12 hours per day in length, according to the Mother Earth News article linked below. September 27th is the first day in 2015 with fewer than 12 hours of daylight – and our average first fall frost is September 23rd. That will only give the plant -4 days to develop tubers. Doesn’t bode terribly well, does it? Oh well. Sometimes when you’re trying to grow weird things, you can’t worry too much about math. Sorry for the terrible picture. I took it with an oca! *I am not a botanist. Your mileage may vary.